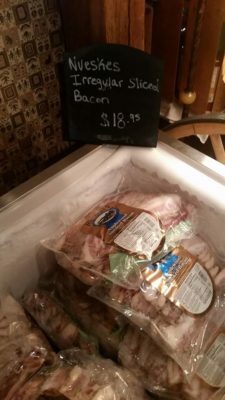 Nueske’s STOCK UP Fall Sale, Get Bacon for 99¢ a pound! One of my FAVORITE sales of the year is back! 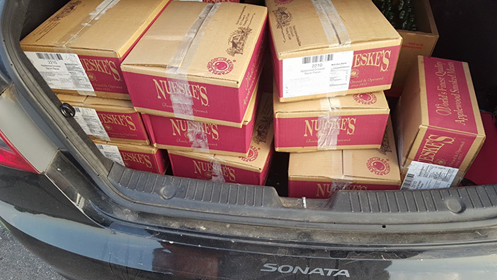 NOTHING is better than Nueskes Fall Sale. You can get bacon for AS LOW AS 99¢ a pound! 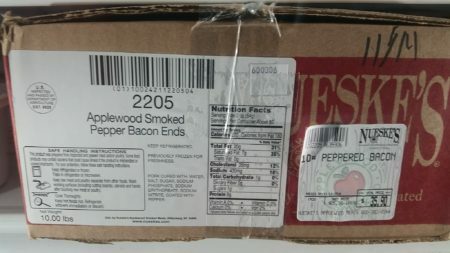 There are lots of options with this sale – Whole Strips, Bacon Pieces, Irregular Sliced, and Ends. PLUS this year they are offering Bone-In Ham Steaks, Bone-In Ham Pieces and Ends, AND Boneless Turkey Breasts! Get to there early because some items will sell out FAST! It is super simple…go in the store, tell the cashier what you want, pay, and get a slip to head outside to the frozen truck. Hand them your slip and they will put your order together for you! PLUS, someone will even help take it to your car if you need assistance! Case Price $77.70 (six 5lb. bags per case, $2.59//lb. or individual 5 lb. bags inside our store, $2.79/lb. or 5 lb. individual bags inside our store $3.49/lb. We stocked up last sale. Each 10# Box has exactly that, TEN POUNDS all in a big blue bag and frozen. What we do is let it thaw just a bit and then use our foodsaver to seal in one pound packages to last us through the year! I also chop some up and fry it up right away and refreeze it for recipes. If you prefer to purchase in smaller amounts, in the store you will also find Irregular sliced smaller packages.